Lead segmentation is a sticky conversation for most marketers. It can get confusing very fast, especially if your organization has more than one core offer. Even marketing gurus can't seem to get it perfect. I can't count how many irrelevant lead nurturing emails I've received from some of the top marketers in the game. It's not any easier for us at Lean Labs. We've been toying with different methods of lead segmentation for a few years now. What we've come up with is starting to work, though. And it has me excited to see it spread to all our clients in the near future. At the most basic level, Lean Labs has two core offers: inbound marketing and website design. For the sake of clarity, I'll explain that we really don't view these as separate offers, because we aren't a typical agency. We view our customers as partners, not clients in the typical sense. We're not built to be an agency that takes on a project for a fee, then disappears into the night until you need us again. We're partners in the sense that we become your growth team. We're essentially remote employees of your company, working to grow your business. We're as invested in our clients' success as they are - and, if we don't perform, they don't have to pay us. We're literally the best kind of employee to have. It's important to make that distinction because, if you get inside one of our marketing funnels, you will have problems keeping them apart. But, for the sake of explaining how we use HubSpot smart lists for lead segmentation, we will be talking as if these two wings of our core offer are separate. This is the first step, because it helps keep the complexity of what you're building, and the logic you have to program into HubSpot, a lot easier to understand. Here's a look at our current funnel diagram for our core offers. It's ugly, because I designed it. But, I'm about to get a prettier version designed by Ernesto, our design maestro. But, you don't care about that, do ya? If someone is sitting in the awareness stage, the purpose of the segmentation and HubSpot smart lists is to craft a system to move them to the interest stage. Our segmentation is as simple as Stage + Core Offer. 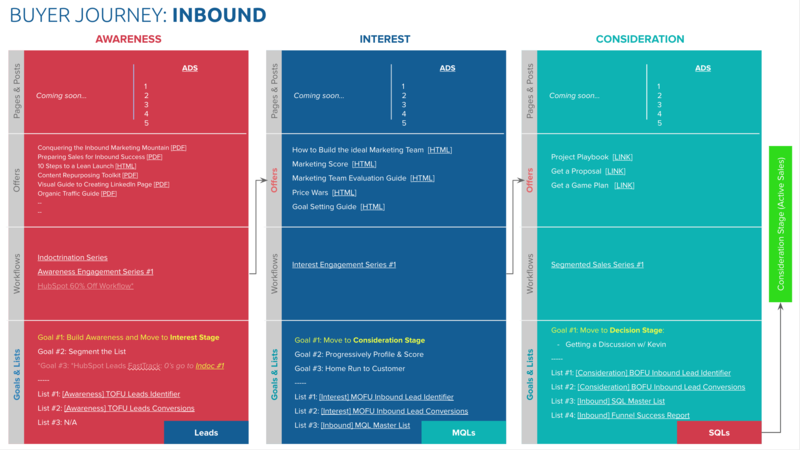 An inbound lead in the interest stage is segmented into middle-of-funnel inbound nurturing lists. On your funnel diagram, list out the lead magnets you have that will generate Awareness leads. Then, list out the offers you have that will identify Interest leads, and so on. Once you have your funnel diagram fully built out, you can move on to step #2. In this step, you're basically building HubSpot smart lists that enroll members based on their conversions. So, if someone downloads our eBook on starting inbound marketing, it will add them to the Inbound Awareness conversions list. It's important to name your HubSpot smart lists with a repeatable convention. The logic for this list, for example, is anyone who has filled out a form on the landing pages for our Awareness Stage lead magnet landing pages. The only logic is conversions. I repeat this step for all stages, using the content offers, website pages, landing pages, etc. that will identify the contact as being at a certain stage in the buyer journey. For instance, if an inbound lead fills out a form to get an inbound game plan, they have converted on an Interest-level offer, which means they are an SQL in the Consideration Stage. Now that you have lists for every stage's conversions, you are ready to start building the smart lists that will be used in the logic for your HubSpot workflows. These lists are really the segmenting lists. I name them with a similar convention, like [LL-Inbound] TOFU-Awareness Identifier. Since the conversions lists are based on actions, this lists allows us to take those actions and apply behaviors and any other qualifications we want to add. For instance, a member of the Awareness identifier list will be a member of the Awareness conversions list, but will not be a member of the later funnel stage identifier lists, and they will also not be MQL, SQL, or CUSTOMER. We use the identifier lists to trigger nurturing workflows. 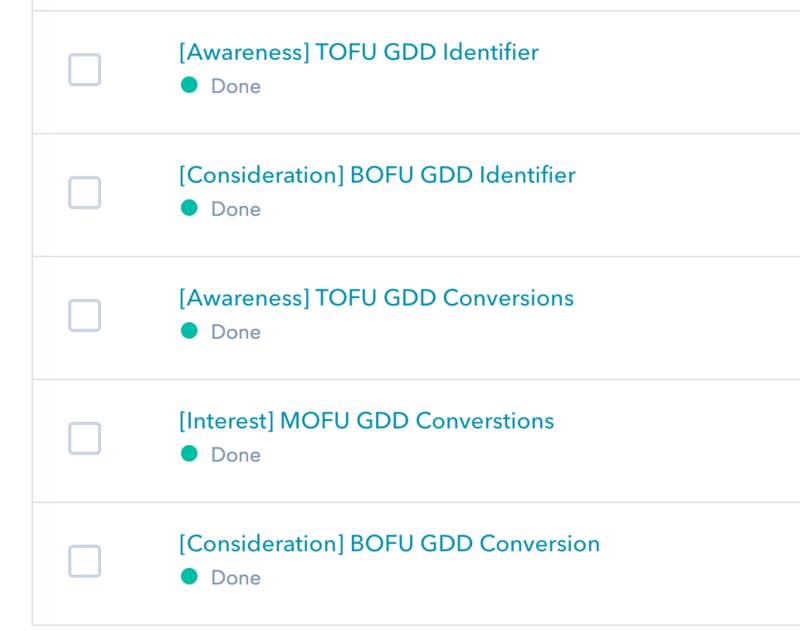 Once a new lead has converted on an Interest (MOFU) offer, they are added to the Interest conversions list, which also adds them to the identifier list (if they pass the other smart list filters to be identified at that stage). Being added to the identifier list removes them from any Awareness nurturing workflows, and triggers off the beginning of the Interest stage nurturing workflows. These lists are not necessary for segmentation, but they allow us to get a better idea of how our segmentation and nurturing is performing. For instance, anyone who converts on an interest offer is considered an MQL (if they pass some other factors based on progressive profiling). Anyone who converts on a consideration offer becomes an SQL. Once they reach the Decision stage, they are an Opportunity. So, we build smart lists to collect a master list of all MQLs across all our core offer funnels. 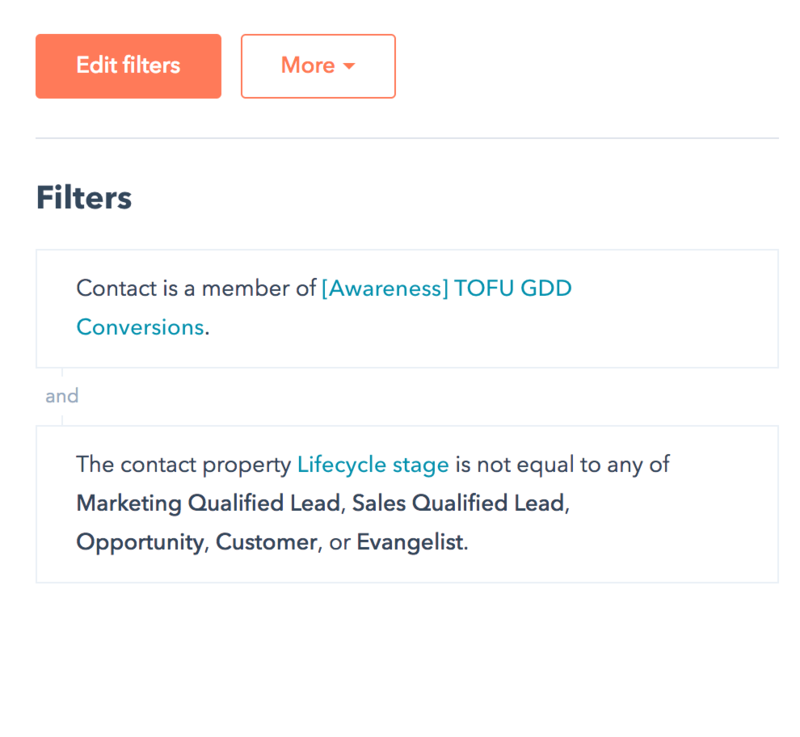 So, regardless of which "track" of nurturing a contact is in, an MQL master list built on Lifecycle stage will allow you to see how many MQL's you have converted in your marketing. This can be repeated for all lifecycle stages. Now, when it comes to managing lifecycle stage, it needs to be matched to the funnel stages. To do this, requires HubSpot workflows. 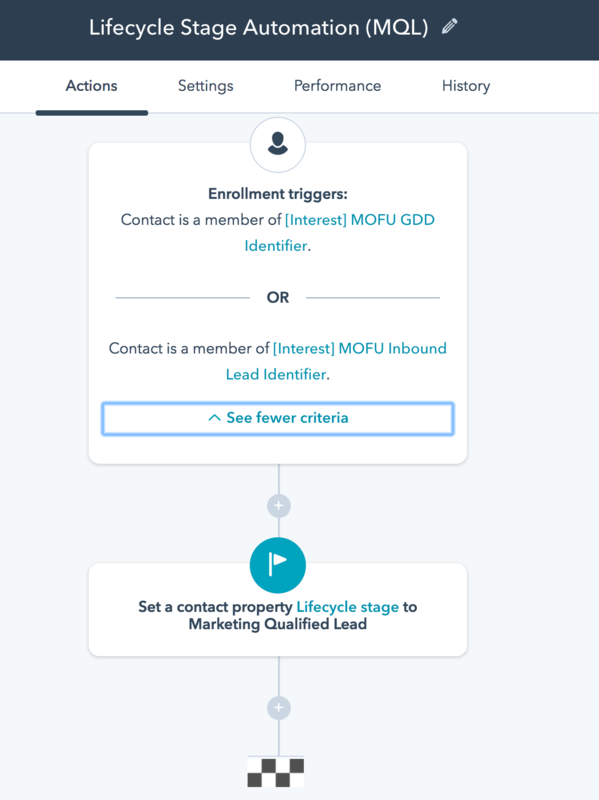 So, we have a simple workflow that is triggered whenever a contact is added to the Interest stage identifier list for the first time will have their Lifecycle stage automatically set to MQL. Same for other stages as long as it makes sense to automate. The only stages we do not automate is Opportunity and Customer. You can see a video of HubSpot lists in action in HubSpot vs. WordPress. Segmenting leads while building lists and workflows in HubSpot can get super confusing and complex really fast. That's why it's important to build a funnel diagram you can make your lists and workflows match. It gives you a visual way of interpreting the needed logic inside of HubSpot. Still, no matter how vigilant you are to the details, you will eventually make a mistake that causes a kink in your nurturing funnels. That's why it's important to run a few hundred contacts through your nurturing funnels and monitor them to make sure leads are being added to the right conversion and identifier lists, and that the right workflows are being triggered in the right order. When you find things not working, you will then go into troubleshooting mode to determine what logic is missing, and how to fix it to make it all work right. In the end, you always be tweaking and working to optimize and improve performance. Hopefully after reading this, you have a better idea how to construct a 1.0 version of smart lists segmentation using HubSpot.